We begin in this chapter with an exploration of the forces that move the prices: the fundamentals. The reader will learn why fundamentals are important to foreign exchange (forex) traders as well as what kind of economic activity are most important in affecting price movements. These include interest rates, interest rate differentials, economic growth, and sentiment regarding the U.S. dollar. In many ways, forex trading is similar to playing a game. You have an opponent (the market). In game of chance the key feature is that everyone faces the same odds and therefore the same level of information. In these games, no player can change the odds. Playing forex, however, is not a game of odds. Participants in forex trading do not share the same amount of information. In forex, this asymmetry of information results in advantages and disadvantages to trades. Some players have more information than the others. In forex, information about fundamental aspects of economies does not arrive simultaneously to all participants. The real important question is what kind of knowledge and information can improve trading performance. The search for an edge starts with a fundamental understanding of the nature of the forex market. Having a foundation of knowledge in fundamentals is a first step in evolving into a winning trader. In getting acquainted with the forex market, most people start by looking only at price charts and price patterns. This is called technical analysis. But the study of what moves those charts is called fundamental analysis. The goal of Part I is to identify the components of fundamental analysis in regard to forex and then provide a recipe for developing your own fundamental analysis of a currency pair. 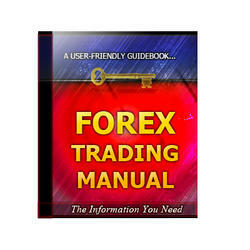 Why take time to look at forex fundamentals? Why should fundamentals matter if a trade is done off a short-term time interval such as the 5-minute chart? The short answer is that one cannot separate the fundamentals from the technical analysis without exposing oneself to great distortions in understanding the forex market. Foreign exchange is by its nature both fundamental and technical and reflect the increased globalization of the world economy. Consider the following: every transaction in the world settles in a currency. Whether it is a consumer purchase, an imported or exported item, an investment in an equity, or even cash under the mattress, the world's economic activity is essentially a flow of money. What makes forex fascinating as a market and as a trading vehicle is the fact that currencies provide an intimate linkage to the world economy. The currency trader by putting on a currency trade becomes a participant the world economy. 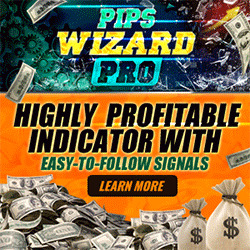 The trader is participating as a speculator looking for a very short-term profit. The forex trader is riding on a global wave. Some will surf the waves, jumping on and off; others will stay in much longer and face the volatility. Forex trading becomes possible because the world is constantly assessing and reassessing the value of one currency against another. The forex currency trader is looking to tap into this stream of changing values. The challenge is to find the right combination of tools that can assist the trader in finding high-probability profitable trades. In meeting this challenge, the first step is understanding what moves currencies over time. In putting together a recipe for successful forex trading, knowing the fundamental chemistry of forex is highly recommended. Anyone who doubts this should simply look at daily headlines that evoke names and places that are part of the daily consciousness of a trader. These names should be familiar to all traders: Bernanke, Fukui, Trichet, Xiaochuan. The words and decisions of these central bankers of the United States, the Bank of Japan, the European Central Bank, and the Bank of China alert the trader to interest rate policy and news that affect sentiment about the direction of the dollar. Mention the capitals Pyongdong, Baghdad, Tehran, and they evoke emotions of fear and crises. Detect news about retail giant Wal-Mart's sales, and one starts anticipating a potential reaction in the currency markets. These and other factors mix together and form the chemistry of forex, which results in shifts of sentiment regarding the U.S. dollar. These shifts in sentiment cause price reactions and shift the balance between buyers and sellers. Let's look in more detail at these fundamental factors. Interest rates are the "dough" of the fundamental forex pie. They are one of the most important factors that affect forex prices, as interest rates are the modern tool that central banks use as a throttle on their economies. The central banks of the world do not hesitate to use this important tool. In recent years almost all of the central banks increased interest rates. The European Central Bank raised interest rates eight times from December 6, 2005, to June 13, 2007, to a level of 4.0 percent to guide a booming European economy to slow down and avoid too high inflation. The United States' central bank—the Federal Reserve—increased interest rates 17 times between June 30, 2004, and August 2006, and then paused when it decided the economy no longer needed the brake of interest rate increases. Interest rate increases do much more than slow down an economy; they also act as a magnet to attract capital to bonds and other interest-bearing instruments. This has been called an "appetite for yield," and when applied globally the flow of capital in and out of a country can be substantially affected by the difference in interest rates between one country and another. In recent years the outflow of capital from Japan to New Zealand, Australia, and Great Britain has reflected money chasing more yield and has been a major multibillion-dollar feature called the "carry trade." The carry trade was driven by the interest rate differential that has existed, for example, between Japan (0.50) and New Zealand (8.0), causing low-cost borrowing in yen to invest in higher-yielding kiwis. There can be no doubt of the critical role interest rates play in forex price movements. 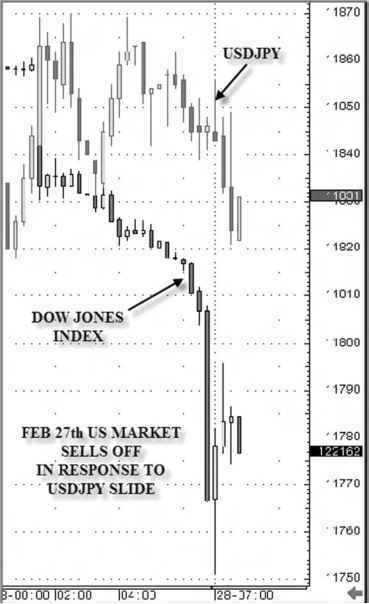 Some forex traders learned this lesson when the U.S. stock market sold off on February 27, 2007. It was precipitated by traders getting out of their carry trade positions. Since billions of dollars were sold to be converted back into yen, equity markets were also affected because equity positions had to be sold to buy back the yen positions. In Figure 1.1 we see how the Dow Jones Industrial Index correlated directly with the U.S. dollar-Japanese yen (USDJPY) pair that day. FIGURE 1.1 Dollar Yen Slide Causes Dow Sell-Off. Source: CQG Inc. Copyright <0 2006. All rights reserved worldwide. Fundamentally, however, one of the most important categories of economic data around the world, which is sensitive to interest rate changes, is housing data. The housing sector in the United States, as well as other nations, provides a major share of wealth, consumer spending, and job creation. Recent years have seen an international housing boom, with prices growing at more than 10 percent per year in many countries. For example, Ireland grew at 15 percent in 2006; Spain's growth actually slowed down to 13 percent. Canada, Norway, and Sweden shared more than 10 percent growth. The United States, in the face of a slowdown, saw prices up 7 percent. This means that the value of homes around the world has doubled in the past 10 years, and as a result the increased wealth has fueled economic growth and consumer purchase. FIGURE 1.2 Home Building Has Slumped. Source: Census Bureau, Bureau of Economic Analysis. have fun. They may very well have used it to buy another house or not spent it at all, but added it to savings. Economists really are not certain. "I guess it is one of those mysteries," said Christopher D. Carroll, an economics professor at Johns Hopkins University. "I don't think anyone knows what the answer is." Nevertheless, mortgage equity withdrawal is closely watched as an indicator of the general economy because, Mr. Carroll said, "there is a lot of concern that a cooling housing market could result in a sharp fallback in consumer spending." A recent paper that Mr. Carroll helped write contends that for every $1,000 change in housing wealth there is an immediate propensity to consume about $20 more. The wealth effect, as the phenomenon is called, is twice as high for housing wealth as it is for stock wealth, Mr. Carroll and his associates said. At the end of 2006, the data on MEWs showed a large decline from the year before in the United States. This was an early indicator of a slowdown in the U.S. economy because it is estimated that two-thirds of the money from MEWs goes for consumption. So the forex trader seeing signs of an MEW slowdown can get ready for its effect to take place months in advance. The importance of housing data as a factor in shaping currency moves has been highlighted further by the events relating to subprime mortgages in the United States. These mortgages were issued during the housing boom/bubble, without the traditional credit requirements. Economic forces ultimately worked to create mortgage delinquencies and a collapse in this market. For the forex trader it is a clear case where fundamentals affect the dollar. More housing weakness translates to weaker consumer demand and that translates to lowering the probability of interest rate increases. It's difficult to be bullish on the dollar in this environment. However, if the housing market starts recovering, the pressures to increase interest rates (or not decrease them) will help attract dollar buyers.